An Astronaut Lands At Grayson! For readers familiar with our school, you know that our students have a passion for the planet Mars. During last semester’s Mission to Mars project, we learned about the European Space Agency (ESA) launch of Schiaparelli, a new vehicle designed to test a method for “soft landings” on Mars. In the new school year, our PBL space mission continues as we study the Schiaparelli landing mission. The students watched live as the ESA monitored the descent, entry, and landing on Mars. While this mission did not meet its objectives, it was another excellent opportunity to discuss how to plan for and learn from failures. This led to a few of our students deciding to build a geodesic dome from popsicle sticks and duct tape to serve as an evacuation habitat that an astronaut could use on Mars (hmm…do you think anyone read The Martian or saw the movie?). Imagine the excitement when we learned that a real NASA Astronaut would be visiting our school! Serena Auñón-Chancellor, M.D.,M.P.H. 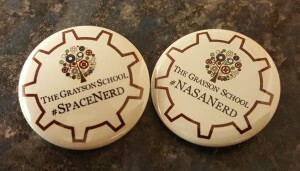 visited Grayson last week for several hours to share her first-hand knowledge about space programs here in America and around the world, such as the ESA. Dr. Auñón-Chancellor began her career at NASA as a Flight Surgeon, which medical expertise she has put to work supporting the health needs of astronauts on a Space Shuttle mission and aboard the International Space Station (ISS). 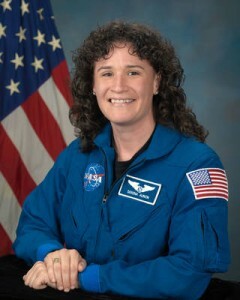 She has served as an Aquanaut with the the NASA Extreme Environment Mission Operations project (NEEMO), living in an underwater research facility and habitat called Aquarius (an Earth-bound analogue for living in space for an extended period of time), and has taken part in an Antarctic expedition to collect meteorites (AMSET), a combined program of NASA, NSF, and the Smithsonian Institution. She described the rigorous training that astronauts go through on technology, health and safety, astronomy, and many more topics so that they are well-prepared for any type of situation that can arise during space travel. This prompted a question from a student: “What was your biggest failure?,” to which she replied that she had a lot of difficulty with underwater training for NEEMO. At the end of our time with her, Dr. Auñón-Chancellor told our students that she was very impressed with their knowledge of the space program, praising them for “knowing more about her work than most adults she speaks to.” We were very proud that their coursework and research are both useful for them and noticeable to an expert ear! If you would like to learn more about The Grayson School, and our programming designed specifically for high-ability learners, please call us at 484.428.3241 or register to visit us at an upcoming Open House or Tour. We look forward to meeting you soon! If you are not in the Philadelphia area, subscribe to our blog at the top of this page to continue receiving our posts on gifted programs and resources for parents and educators.